Weekday morning breakfast is usually a quick affair for us with leftovers from the weekend or perhaps cereal with fruit. But today we woke up to ice on the roads and an announcement that schools were closed, so I decided to do something fun and make muffins. 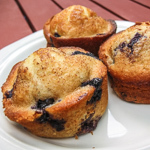 The recipe comes from Michael’s mother, a variation on her blueberry muffins that we enjoy during our treks to the family camp. The boys made quick work of them and there are none left for a snack! My three-year-old wanted to help make breakfast, so I put him to work sifting the dry ingredients. I measured the flour, sugar, salt, baking powder, and cinnamon, and he sifted and whisked the mixture for me. He was quite a little helper! These are easy to whip up on short notice, and you can save time by premixing the dry ingredients and topping the night before. The muffins are on the small side, not like big gourmet muffins, but for little appetites that’s a good thing. If you want bigger muffins, you can make just eight muffins or you can make a double batch of batter and bake 18 muffins instead of 24. 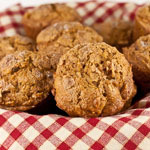 Whether you like big or small muffins, these make a tasty treat on a cold morning. With a hot cup of English Breakfast tea, I enjoyed a nice breakfast today, even though the boys were bouncing off the walls. The topping makes enough for at least two batches, so you can save the extras for another time. Mix the topping ingredients in the small bowl and set aside. In the large mixing bowl, beat the egg. Stir in the milk, oil, and grated apple. In the medium bowl sift together the flour, sugar, baking powder, salt, and cinnamon. Add to egg mixture, stirring just until flour is moistened. Batter will be a bit lumpy, so don't over mix. Immediately put one scoop full of batter into each greased muffin cup (2/3 full) and then lightly sprinkle the crunch mixture on top. Bake for 20 to 25 minutes, until golden brown. For a quick breakfast or brunch item, mix the topping ingredients, and sift together the flour, sugar, baking, powder, salt, and cinnamon the night before. This looks divine. I really like the idea of the crunch in this! Our breakfasts usually have some left over components in them too. But baking fresh,hot muffins out of the oven in the morning is really special. Your kids are sooo lucky, and husband too. Do they know that? Thanks, Meeta! We really like the crunchy topping. White on Rice Couple, thank you! The boys love helping out in the kitchen. 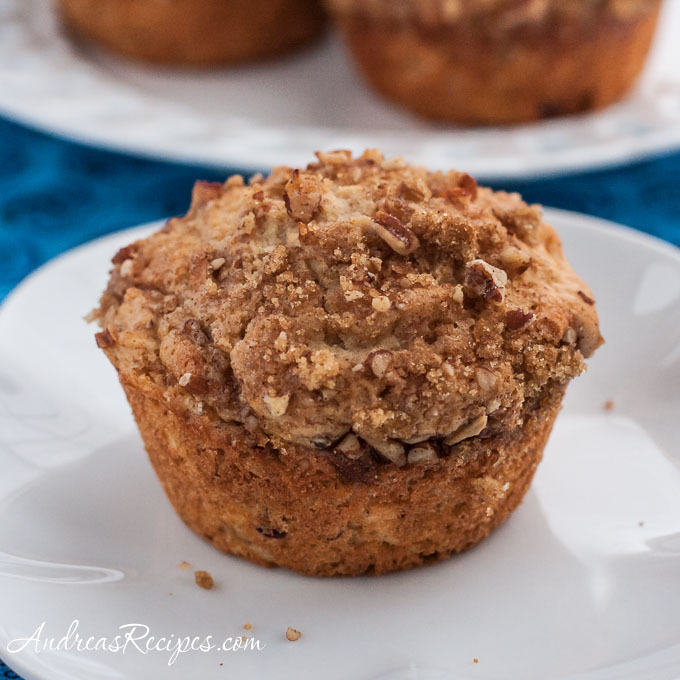 Always on the hunt for another muffin recipe…crunchy topping will make these taste soo good! Hello! I think these look and sound yummy and I’d like to make them! I live in Holland now (am American) and am unsure if I can get Canola oil here. Is there a substitute I can use if I don’t find it? Hi Laura. I don’t know what types of cooking oil you can find in Holland, but regular vegetable oil or corn oil would be good substitutes. Ahhh! I just made these and since i don’t usually make muffins i went with the 3 *tablespoons* of baking powder. was that supposed to be teaspoons? These looked great but they turned out to taste not so great – I even added butter to the crunch topping to make them more ‘crisp’ like…I also reduced the baking powder to 3 t instead of 3 T (which is still a lot) – They are not very good – very bland…very salty…not much flavor and they leave a bitter taste in your mouth. I am glad I tried these out before making them for guests. Note from Andrea: There were two typographical errors in the recipe in the measurements for baking powder and salt. I have corrected both and apologize for the error. Thanks to all of you who have tried the muffins! I tend to make breakfast ahead of time, so once these muffins are baked how long to you they would be good for? Hi Priya. 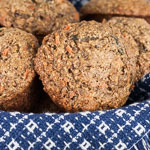 The muffins are best eaten within 24 hours, so you can make them the night before serving.